This is a lovely entrée for family or a dinner party. I’ve haven’t done this in years and decided it was thyme…er…time. The thigh-drumstick combo can be stuffed with a bread stuffing, but I’m using ground chicken with herbs and other good things. 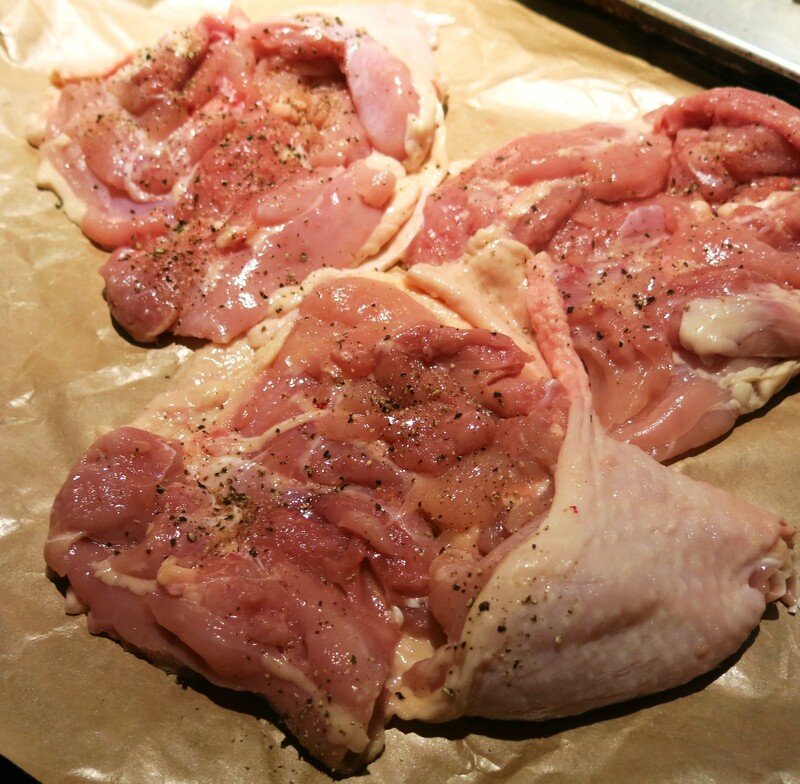 First, you need to debone the chicken quarter, leaving as much skin as possible intact. You can debone the entire thigh-drumstick combo yourself. It’s really quite easy, but a very sharp, thin-bladed knife is essential. Also, there are a number of YouTube videos that explain just how to do it. Of course, you can have your butcher do it. Many butchers won’t charge extra, but some will. Now you have your deboned chicken quarter. Season the non-skin side with salt and pepper and set aside. 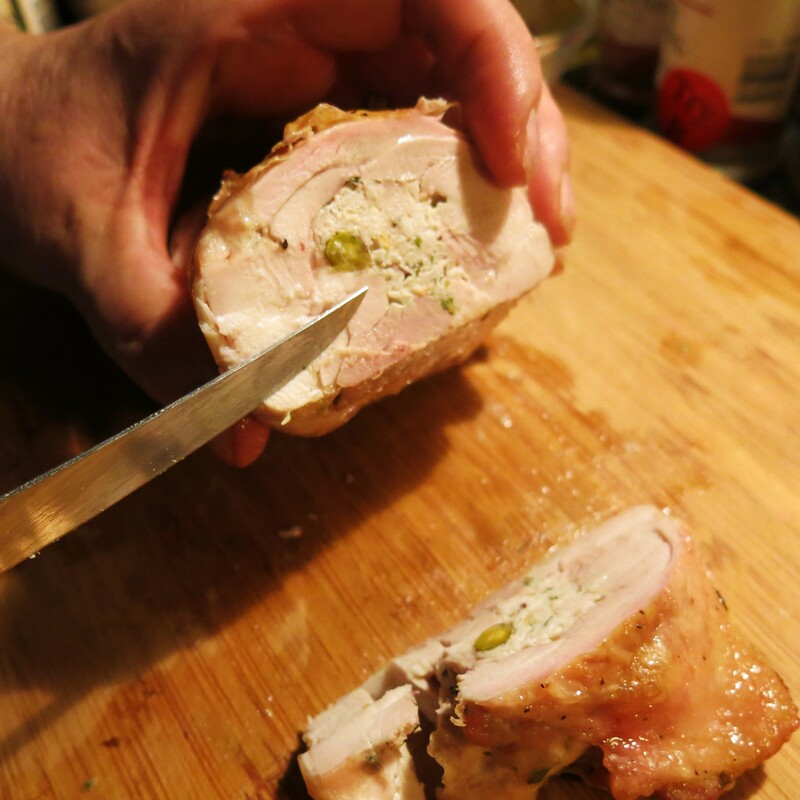 When you make your stuffing, and this can be meat, like The Goddess opted for…she likes that whole meat-in-meat thing. Or she’s been know to do a more traditional bread stuffing or on with spinach, sun-dried tomatoes and ricotta (she prefers to use that for breasts, as they don’t cook quite as long). There are as many options for stuffing as you can think of. I stuff them and then chill them overnight. The meat sets up better and they hold together better. Service is simple and impressive. You’re going to slice the meat and fan out the slices on a nice platter with sprigs of rosemary, parsley, sage, etc. 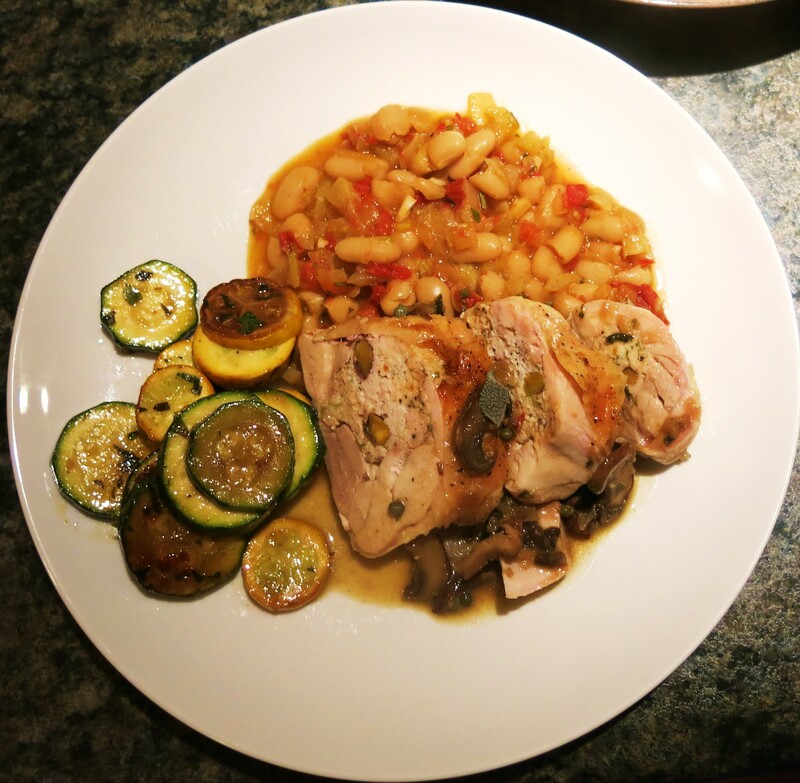 The Goddess was thinking about Tuscan flavors, so she decided to go with cannelini beans, seasoned with rosemary, garlic, fennel, and perhaps a little tomato. You will want to have a nice sauce, because it truly is all about the sauce. Or at least significantly about the sauce. This sauce is simply pan juices with shallots, mushrooms, some finely chopped Preserved Lemons and thyme added, along with some white wine. The Middle Son and The Unbound Reader, as well as The Latin Lover are here for the weekend. This is their sort of food. And since it is mostly made ahead, it’s The Goddess’s kind of food, too. The Goddess is smiling. Season the cut side of the deboned meat with a good sprinkling of salt and pepper. In a small bowl, combine the filling ingredients; stir until thoroughly combined. Divide the meat in thirds or fourths (depending on how many quarters you have). 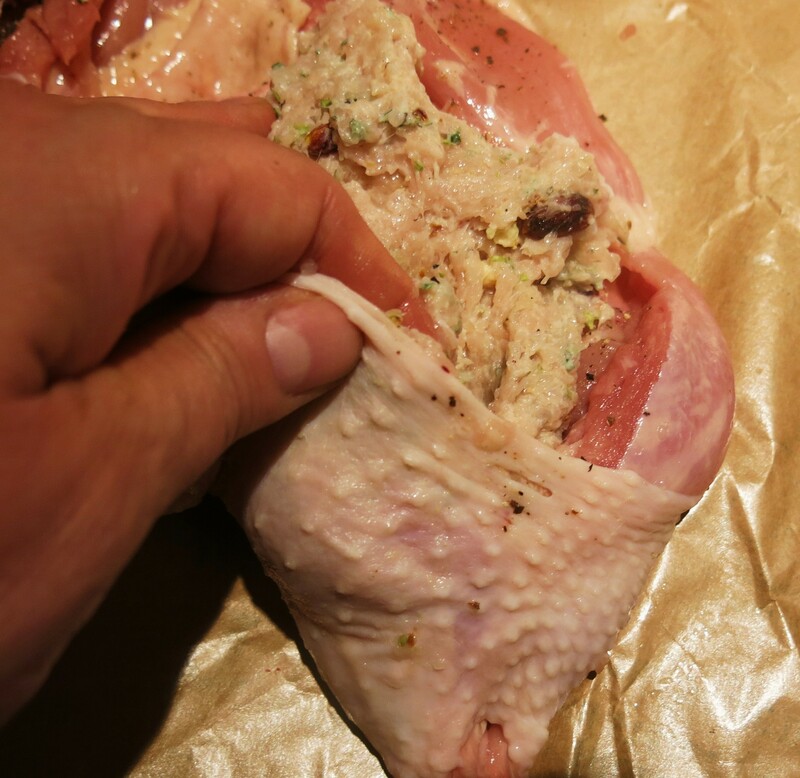 Using you fingers, push some of the portion, about half into the drumstick where the bone was removed. Push the rest into the thigh where that bone was removed. Reform the quarter as best you can to its original shape, stretching the skin around as much as possible. Place skin-side down on a plate. Cover with plastic and chill for at least 6 hours or overnight. Remove the chicken from the oven about 30 minutes before you’re going to use it. Preheat the oven to 400°F. Drizzle a large oven-proof skillet with a good drizzle of olive oil. Place the stuffed chicken quarters in the skillet, skin-side up; do not crowd them. They should not be touching each other. Roast until done, 185°F in the center. About 30-50 minutes, depending on the size of the chicken quarters. Remove the pan from the oven; place the chicken on a platter. Let stand, loosely tented with foil, for at least 15 minutes. Meanwhile, place the skillet on a burner (BE CAREFUL! The pan is HOT from the oven!). Add the onion or leek and mushrooms. Sauté over medium-high heat until the vegetables become limp, but don’t let them brown. Add the sun-dried tomatoes, if using and pour the wine into the pan, scraping up the bits to deglaze the pan. Turn the heat up and let the mixture reduce to about 1 cup. 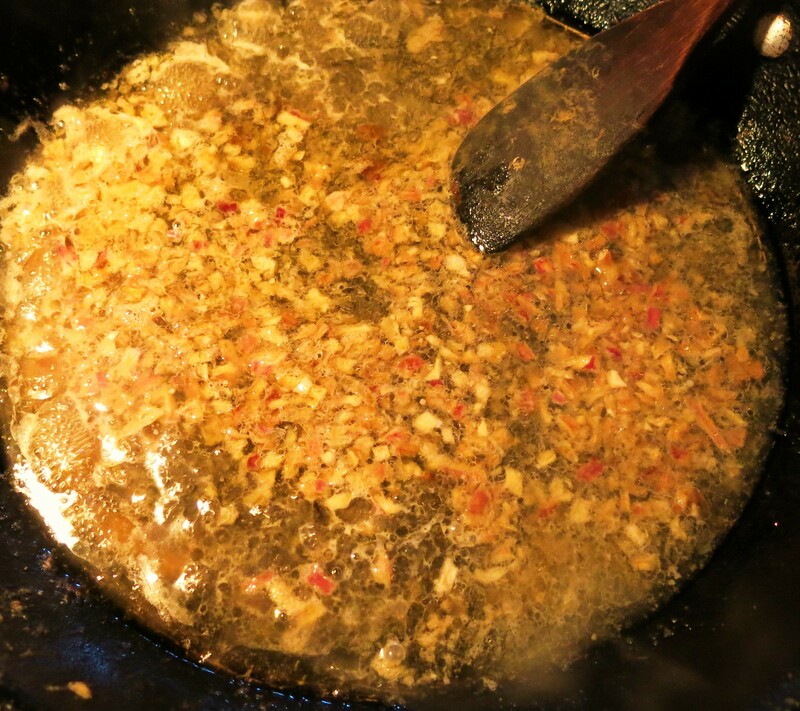 Remove the pan from the heat, add the capers and whisk in the butter on piece at a time. 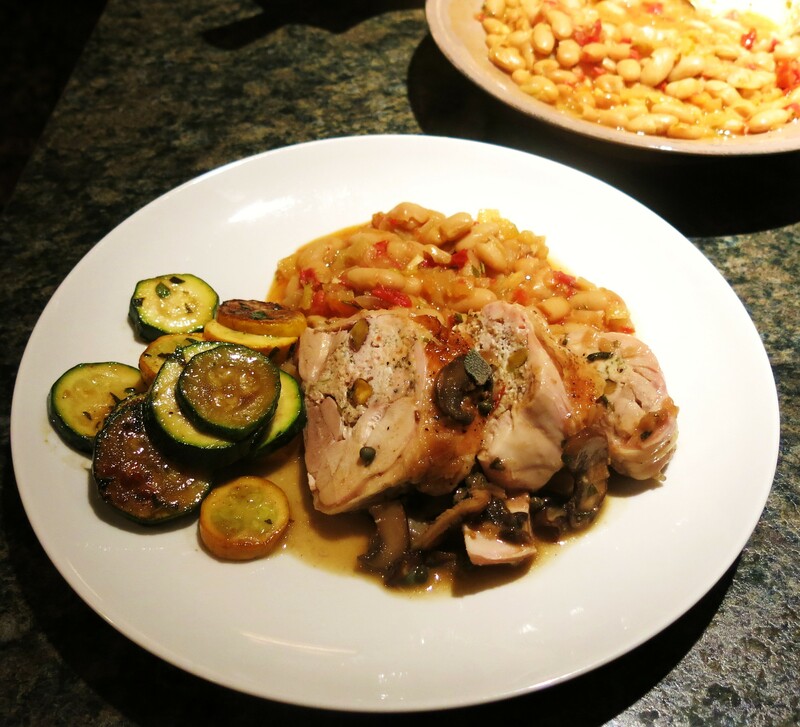 Slice the chicken, pour the sauce over and serve with Tuscan White Beans on the side. 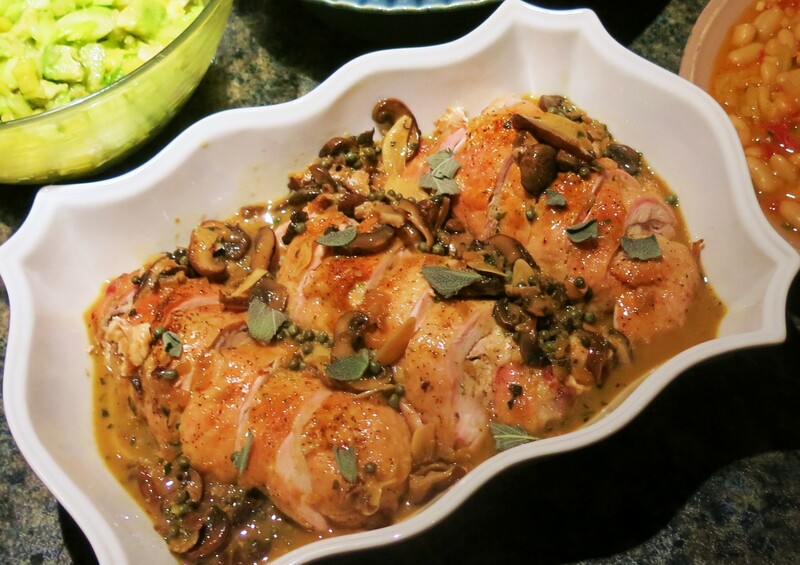 Tuscan Stuffed Chicken with Mushroom-Shallot Wine Sauce Recipe©Marcia Lahens 2015. All rights reserved. This is a very flexible recipe. You can add diced sun-dried tomatoes to the stuffing which I might have done, had I thought of it…tomorrow is another day! You can serve the slices over rice or polenta and it’s also delicious along side roasted potatoes with rosemary and garlic. I’m serving it with Tuscan White Beans and some Catalan Tomato Bread. Okay, that’s Spanish, but the Italians have their version that’s more or less the same…work with me here, people. I think fruit or sorbet for dessert will do it. Buon Appetito!! !